What's Up Wednesday - New Demonstrators Join Stampin' Up for $125.00! Good Evening Everyone! I normally try not to overwhelm you with too many posts, however; there is an incredible offer from Stampin' Up to become a New Demonstrator during Sale A Bration. Would you like to grow a flexible home-based business with earning potential and lots of fun? Does having the ability to be your own boss, set your own hours, and earn cash, trips, and free products appeal to you? Then discover the Stampin' Up Business Opportunity and not only enhance your financial situation, but save money on stamps, accessories, and craft supplies. You will indulge in your love of stamping and paper crafting as you coach others to be creative and spark your imagination with hundreds of ideas from Stampin' Up magazines, catalogs, online galleries, and events. Plus you will receive recognition for your creative and business achievements as you discover new artistic techniques to inspire you. 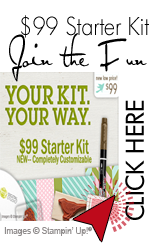 Any New Demonstrator who joins Stampin' Up during Sale A Bration will get the Starter Kit for $125.00! That is over $300.00 worth of Stampin' Up Products plus business supplies. 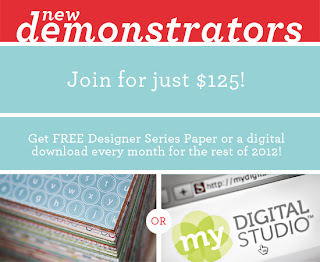 Additionally, each new demonstrator will get a pack of designer paper or a digital download up to $10.95 each month they remain a demonstrator. If you have been on the fence about signing up, now is the time! If you would like to be apart of the Stampin' Up Family and join my team, click here! Happy Stamping!